Nothing says “Good Morning” (or “Good Evening” if you’re not a morning person) better than a nice cup of coffee. Which is why you should be having with you the latest coffee makers in the market. And this doesn’t mean that you have to rob a bank to buy one. There are several options that are quite affordable. Here are ten of the best coffee makers in the market that are available for less than $200. One of the best coffee makers on the market is the Zojirushi EC-YSC 100 Coffee Maker. With this coffee maker, you can accurately know the number of cups to make as its water tank has well-labelled water measure lines. The water tank is removable to prevent spillages when filling. Plus it is fully washable. Talking about washing, the coffee maker has a lighting system that indicates when cleaning is required. The Zojirushi EC-YSC 100 can make up to 10 cups of coffee. This coffee maker is one of the cheaper options in the market, having a price tag of only $124.99. The Touch Plus Single Serve Coffee Brewer is the latest offering from renowned coffee maker manufacturer, Touch. You won’t have to worry about bacteria when making your coffee since the coffee brewer does not have an internal water tank. 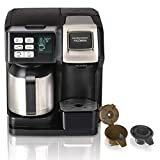 Another notable feature about this coffee maker is its energy-saving ability as it will power off automatically when not in use. The coffee maker can make up to four cups of coffee. The Touch Plus Single Serve Coffee Brewer has an affordable price of only $189.99. The Cuisinart SS-15 coffee maker has a sophisticated modern design. When brewing you can pause the process using its brew-pause feature. The coffee brewer comes with a removable 40-ounce reservoir. With this coffee maker, cleanliness is a priority as it has self-cleaning abilities. The coffee maker comes with a one-year warranty from the manufacturer. The Cuisinart SS-15 automatically shuts off after making a nice cup of coffee, saving energy. The Cuisinart SS-15 coffee brewer can make up to 12 five-ounce cups of coffee at a time. The coffee maker comes with a price tag of only $199.00. The name says it all. The BUNN NHS Velocity Brew Coffee Brewer provides a brewing experience that is lightning-fast. This coffee maker brews coffee with great taste due to its multi-stream spray head. You won’t have to worry about making a mess when serving your coffee using the BUNN NHS Velocity Brew Coffee Brewer’s drip-free carafe. 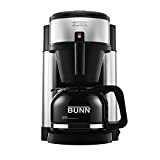 The manufacturer, BUNN, provides you with a three-year warranty upon purchasing the coffee maker. The coffee brewer can make a maximum of 10 cups of coffee. 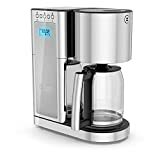 The BUNN NHS Velocity Brew Coffee Brewer is among the most affordable coffee makers in the market, having a price tag of only $104.71. The modern design on the Hamilton Beach (49966) Coffee Maker is the first thing that catches your eye. But the coffee maker has more than meets the eye. First, its carafe is made out of stainless steel which aids in keeping your coffee fresh and hot. The coffee brewer does not have one but two easy-fill reservoirs. The Hamilton Beach Coffee Maker allows you choose to either brew a full pot or a single cup. The full-pot of the Hamilton Beach can brew a maximum of 10 cups of coffee. The Hamilton Beach Coffee Maker comes with a price tag of only $119.99. Another great option is the Capresso 487.05 Team Pro Plus Glass Carafe Coffee Maker. Unlike other coffee makers that have high grinding speeds, the Capresso 487.05 allows you to slow down the grinding speed to under 500 rpm to maintain the coffee’s authentic aroma. To minimize ground coffee from being left in the grinder, the coffee maker has a two-step grind and clean process which is fully adjustable. The Capresso 487.05 Coffee Maker can brew up to 10 cups of coffee. 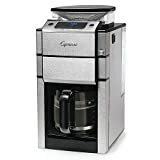 It will cost you $195.63 to purchase the Capresso 487.05 Coffee Maker. The Keurig K575 is another affordable coffee maker in the market. The Keurig K575 exudes sophistication, having a 2.8-inch touch screen plus nightlight colors to make a statement. The coffee maker is exceptionally small, being 13.2 inches tall and 10.5 inches wide making it easily portable. The coffee maker comes with two water filters and one filter handle. With a 80-ounce reservoir, the Keurig K575 Coffee Maker is able to brew a maximum of 10 cups. The Keurig K575 Coffee Maker is priced at $170.86. 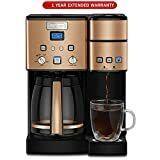 One nice feature found in this coffee maker is its permanent gold-tone filter which, unlike the ordinary paper filters, saves you time. 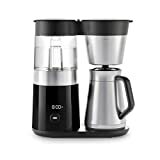 The manufacturer has incorporated the advanced showerhead technology in the coffee maker which ensures that the coffee retains its smooth taste. The Russell Hobbs Glass Series Coffeemaker CM8100GYR comes with a two-year warranty from the manufacturer. The Russell Hobbs CM8100GYR can make eight cups of coffee each being 5 ounces. This coffee maker is one to consider when it comes to price as it costs only $129.99. The OXO on Barista Brain Coffee Maker is another amazing coffee maker that is under $200. Its rainmaker showerhead helps in extracting the full flavor of the coffee while maintaining uniform saturation. A modern coffee maker, the OXO on Barista Brain has a nice LED screen that displays a freshness indicators. The coffee maker can make up to nine cups of coffee. It costs $199.95 to purchase the OXO on Barista Coffee Maker. Nespresso Inissia Original Espresso Machine stands out primarily because of its simple design and light-weight. But the simplicity of the coffee maker hides the state-of-the-art coffee-making technology incorporated into the machine. For starters, the Nespresso Inissia has an extraction system that produces 19 bars of pressure. With the pressure comes a faster boiling duration, taking only 25 seconds for your coffee to boil. The Nespresso Inissia Original Espresso Machine can brew one cup of coffee at a time. 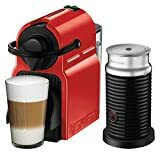 The espresso machine comes at a price of $199.35. As you can see, there is no need to take a loan to acquire a coffee maker, when there are coffee makers under $200. Plus, they come with extraordinary features even at their low costs. The coffee makers come with different features that suit the preferences of anybody. So whether you’re looking for sophistication or simplicity in a coffee maker, there is an option available to suit your taste.